I realized I never published this one, so I'm doing it now because I am so thankful to be able to live this life on this farm with my family . . .
From November . . . I'm sure you have all seen on Facebook the daily posts of Thanksgiving. Personally, I think this is one of the best trends to come out of Facebook. Anything positive in print is welcome on my computer, especially post-election. While I haven't been posting daily online, I do believe strongly in daily thanksgiving. My list begins with the up-close-and-personal relationships in my life, without which there is no meaning to the rest of it. But since this is a "farm" blog, I thought I would share some of the things for which I am thankful that are related to this little piece of heaven. One of my favorite quotes from Oscar Wilde is, “There are only two tragedies in life: one is not getting what one wants, and the other is getting it.” As a little girl, I dreamed of having a horse farm when I grew up. Now, though, I cannot count the number of days I have questioned the insanity of getting back into horses and buying/building a farm. Seven hores have come into my life in the past seven years (with 4 taking up permanent residence), and I don't seem to have made a lot of progress in the dressage department, except that I now have a pasture full of retired, very large black horses. I certainly wouldn't go so far as to call it a tragedy, but where is the blessing and thanksgiving in this? Second, I am thankful for the ability to care for three wonderful geldings who deserve a great retirement. They are like my extra children, from the sensitive one who clings to his mother, to the "too cool" TB who marches to his own beat, and finally the gentle giant who literally licks my face each day like a black labrador. I know part of my purpose has been to give them the gentlemen's life of leisure in their older years, and I smile at their sweet nickers when they see me coming. But here is where I am beyond thankful and completely excited. I have tried and tried to find that "horse of a lifetime," and I have failed. You know that horse - the one that every horseman and woman talks about, the one that when they reminisce, they say, "there will never be another one like him." - yeah, I still haven't had that. 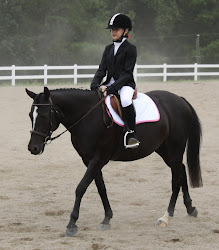 The reason I am so thankful is that I know that my "horse of a lifetime" is still in my future and not in my past. I am thankful that the best is yet to come and that I'm not telling stories about the glory days, but still dreaming the big horse dreams of my future. And each of these "not it" horses has taught me so much about being a rider and a keeper of horses that I will be a better person for that horse of my lifetime when he or she does come to live at Sally Run.